I plucked this choice bit off of the New Yorker's website. 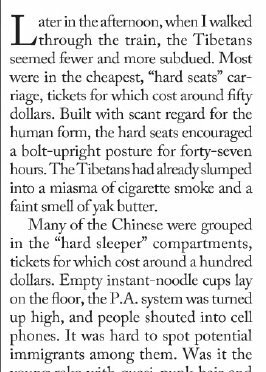 It's from 2007, when the train to Tibet first opened. Between this and the consideration that the ethics of the train to Tibet were complicated, maybe it was for the best that I couldn't get a sleeper and had chosen to fly instead. I had to be ready to go to the airport at 5 in the morning...ouch. I got into the van for the group transfer for all morning flights, and a cynical tourist inside the van told me something that I wasn't sure if I should believe or not. "You booked through the hostel? You booked with CITS, then. 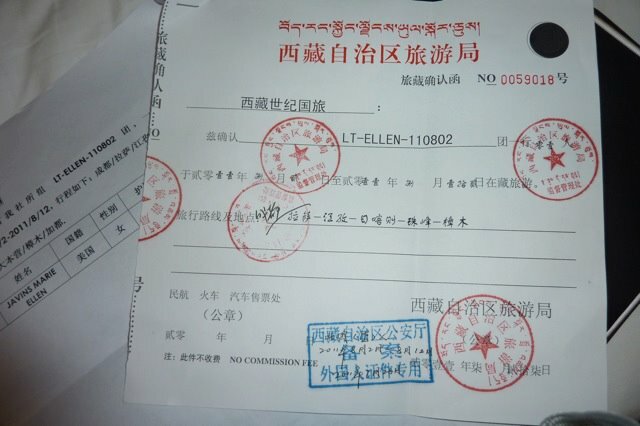 Not with a Tibetan agency." I stared at him in shock. That couldn't be true, could it? But...I'd booked with something called CTITS...it slowly dawned on me that I might have booked with a shell. I'd had trouble finding information on them online. Really? Had I? I'd been trying to book with a Tibetan agency. The travel desk had assured me that this was a Tibetan agency. And what the hell did some random guy in a van know? More research required, I thought. Then he startled me again. "Which flight are you on, the 7 one of the 7:10?" "There are two flights? Uh-oh." I'd suddenly realized last night (after the travel desk had closed) that I had no paperwork for my flight. No e-ticket number, no itinerary. Nothing but a receipt with a scribble that I'd paid. 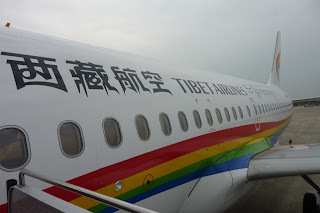 And now I learned that there were actually TWO airlines flying from Chengdu to Lhasa this morning. I had no choice. I'd just have to ask until someone found me on the computer. "Hello, uh...I'm on this morning's flight to Lhasa." I brazenly tried the first airline I came to, one that had opened only a few week's prior. I had a 50/50 chance of choosing right. I got lucky. An efficient booking agent took my luggage in exchange for a boarding pass. I am always cranky in the morning and so I headed to the airport KFC for some coffee, which helped my mood a little. 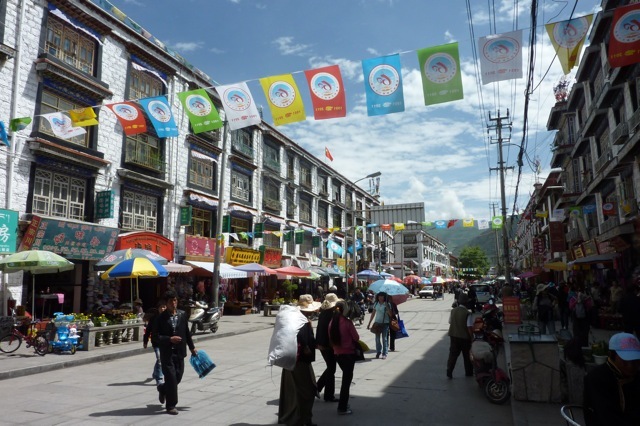 But I was already pissed at China for its stupid permit and the fact that 5.8 million Chinese tourists could swarm Lhasa but the relatively few westerners were heavily controlled and babysat. If there was danger, why was it to me and not to the other millions of tourists? Or was *I* the danger? The camera they couldn't control? Damn straight I would have taken photos if an incident had occurred. They were right about that. But they seem to be missing the point that 5.8 million Chinese tourists have cameras too, not to mention every citizen in Tibet having one on a cell phone. And no one can control what gets out anymore. The Great Wall didn't keep anyone out and the Great Firewall is so pointless as to be absurd. Have I alienated anyone yet? I had been reading that New Yorker article, reading Seven Years in Tibet and the Autobiography of the Dalai Lama, learning about the complex relationship between China and Tibet. I could see it, see how in the fifties, the idealistic Maoists had been able to justify their actions to liberate the Tibetans from their feudal monk overlords. As someone with not an ounce of respect for organized religion (and not much for the kind without organization), it's not hard to see how they could have thought this, though it's easier to note the geographic advantages of including Tibet in one's borders, and today we know about the vast mineral resources. But hey, let's try to think about this from what they knew in the fifties, when the Red Army swarmed in. Things didn't go too well, with a lot of Tibetans ending up dead and the government fleeing to India. We all know that. And 99 percent of the monasteries were destroyed. But now...things had changed. 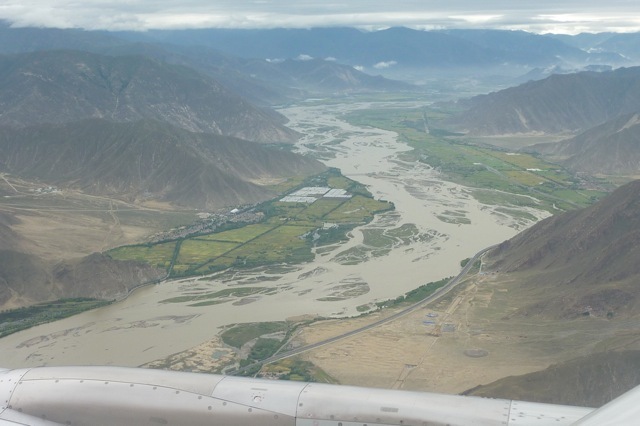 China was investing huge amounts of infrastructure into Tibet. And Chinese tourists were clamoring to see the unique religious culture of Tibet. 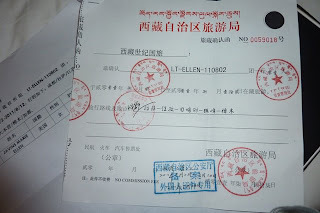 Not yet knowing where this was all going, but born to be suspicious, I showed my travel permit to no less than three people before I boarded the plane to Lhasa. The flight was short, and before too long, I wandered out of baggage claim to where a guide with a fake guide-smile encircled my neck with a white welcome scarf. He promised to come to the Yak Hotel that his agency had booked me into ("All the hotels are booked but my agency has a good relationship with the hotel") after he saw off a group that had a problem with its flight. He stuck me in a 4x4 with a silent driver, who drove me through a long, new tunnel, a newly opened shortcut from the airport to Lhasa. And I was confused about Tibet and pissed-off that I had to pay a minder to keep an eye on me for the next nine days. I sullenly checked into the Yak, which was mid-range and charmingly run-down, a little dirty but acceptable. I learned quickly that the restaurant next door was outstanding and that if I put my laptop by the window and opened it, I could pick up the restaurant's wifi signal. The road in front of the hotel was a jangle of bells, as bicycle rickshaws zipped by ringing bells to attract customers. I was in fabled Tibet, had a bad attitude, and was confused about the morality of what I was doing and what the Chinese were doing. In time, I thought, perhaps this would all become clear. I went to the restaurant to have some coffee, in hopes that it would turn me into a more civilized person by the time the guide showed up. It's a metaphor, you know. You can check out of wanting to hear that damn song anytime you like, but it will still be with you. What is it with that song?! You cannot get away from it. I like to think of the Mojo Nixon tune "Don Henley must die" any time I'm forced to listen to it.